Lovely still playful as she heads into the last 3 weeks of pregnancy - shown here with two of the loves of her life - Kiera and Jason. We had some wonderful news this week !! Ultrasound confirmed what we were all suspecting – our beautiful and sweet girl Lovely is definitely expecting and everything is looking good ! This will be Lovely’s last litter with us – so it will be an extremely special time for all of us. For the last few months Lovely has been living with and lovingly cared for (and spoiled and pampered) by our good friends Sherri and Jason Moody and their adorable children Kiera and Robee… but she will be returning to live with us shortly for the final stages of her pregnancy. 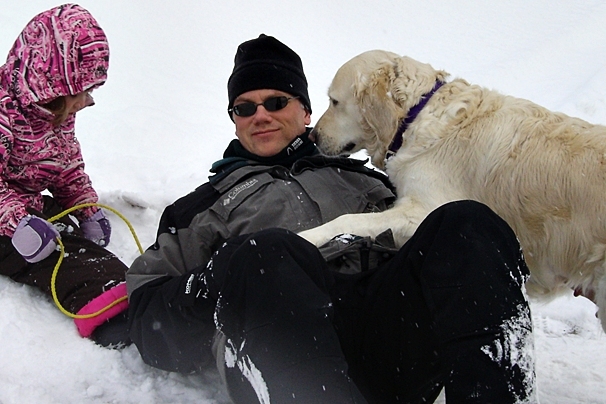 From time to time we allow one of our older goldens to move on and stay with a very special family – as this gives me time to work with, train and care for some of our up and coming youngsters and give the goldens living with us the quality of time and nurturing they deserve!! So Lovely has a wonderful forever family with the Moody’s – but it will be a very treasured time to have her come back and stay with us for this last litter and some wonderful adventures on the lake…. Hopefully spring will come early and Lovely will get to enjoy the water a bit during her “maternity leave”. 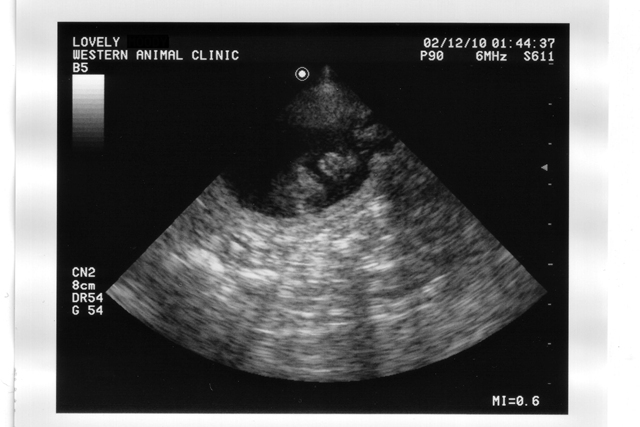 Developing puppy inside of Lovely - dark oval area is the gestational sac. At this stage of puppy development – Lovely’s little puppies are heading into a big growth curve. Their heartbeat can be easily detected, they are developing toes, whiskers and claws and are clearly beginning to look like little dogs ! The whole miracle of birth and the speed at which all the development unfolds within the womb still amazes me every time !! Lovely is on the very best diet possible to ensure that her little growing puppies are receiving all the nutrition they need for the best start in life. At the abdomen Lovely is currently measuring an expanding 83 cms – it will probably be awhile before she will see those numbers again !! 🙂 Of course Lovely continues to be her same beautiful self – just a complete sweetheart in every way. I feel very blessed to have her as part of our golden family and I am looking forward to the stellar personality that she will pass onto these little lives that are growing inside of her.